Adult gymnastics provides a new opportunity for anyone aged 18+ to try out or return to our amazing sport. Does your club want to offer something different to your older gymnasts once they’ve stopped competing to keep them participating? Or do you have any parents or enthusiastic adults who want to try gymnastics for the first time? Adult gymnastics can broaden your club offering and diversify revenue streams within the club, while utilising your space during quieter period such as early mornings, lunchtime or later in the evening. Our pdf Adult Support Guide (4.56 MB) provides a step by step guide to setting up and delivering adult gymnastics within a club, as well as how to break down the common barriers and challenges in delivering gymnastics activities to adults. We have also developed a dedicated Discover Adult Gymnastics workshop, where coaches can learn how to deliver a progressive and engaging programme for adults. Register your interest in a Discover Adult Gymnastics workshop by contacting [email protected]. Want to see the success of other adult gymnastics sessions? Read the case study on pdf Swanage Gymnastics adult sessions (593 KB) . A competition open to anyone aged 18 and over, regardless of experience or ability, with the opportunity to socialise and compete. 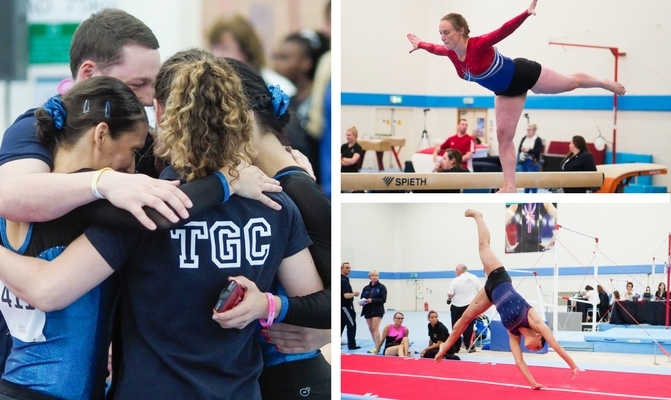 The event creates a fun and relaxed atmosphere where competitors can meet like-minded people whilst showcasing their gymnastics skills to one another. It is a multi-discipline event where competitors can enter Acrobatic, Men’s Artistic, Trampoline, Tumbling or Women’s Artistic competitions. Adults may even choose to enter several disciplines. To get involved, why not join our ‘Adult Gymnastics’ Facebook group and become part of this fantastic community! The 2018 Adult British Championships will be held on 25-26 August 2018 at Lilleshall National Sports Centre. Many clubs with well-established adult sessions run successful adult competitions. This is a great starting point for those adults who have never competed before and helps create a network of participants. As with the Adult Gymnastics British Championships, all competitions are relaxed and highly sociable with a number of disciplines on offer. Can’t find a suitable competition? Why not run your own? We have created a pdf handy event guide (804 KB) to support you in setting up your own adult competition. Participating in festivals such as GymFusion or our international festivals provides the opportunity for gymnasts of all ages and abilities to showcase their gymnastics skills in front of a captive audience in theatre-like venues. Festivals are the perfect opportunity for adults to perform as part of a team and socialise with other like-minded people from all over the world.